Combining high definition retransfer print quality with an intelligent interface and in-line visual security, Helix is the new foundation of trusted identity. 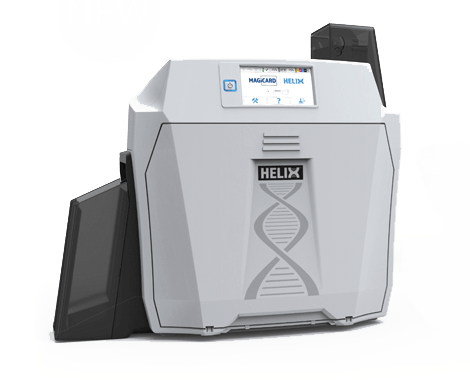 The Magicard Helix is the first ever desktop card printer to feature an interactive touch-screen interface. Visual indicators show connectivity, temperature and how many prints are remaining on all consumables. A preview screen during printing shows the exact card being personalized and its progress through the print cycle. The intuitive interface makes it easy to change settings, with additional help provided through animated video sequences. Helix is the World’s first retransfer printer with built-in visual security. Using an evolution of Magicard’s famous HoloKote® security feature, Helix can apply a secure watermark to each card during the retransfer process. This feature also exploits the wavelengths and lens effect of the retransfer film to fluoresce under UV lighting conditions. The Magicard Helix uses a retransfer printing process, where images are first printed onto a thin film then heat transferred onto the card surface. This produces our highest resolution photo quality image, printed right over the edge of the card. By printing on to this controlled substrate, print imperfections due to irregular card surfaces or around embedded card chips are eliminated. Equipped with a high grade processing unit, Helix is powered by Magicard’s most advanced and durable print engine and features our highest capacity consumables (1000 prints) and hoppers (200 cards), making it ideal for high volume localised or even centralised issuance.